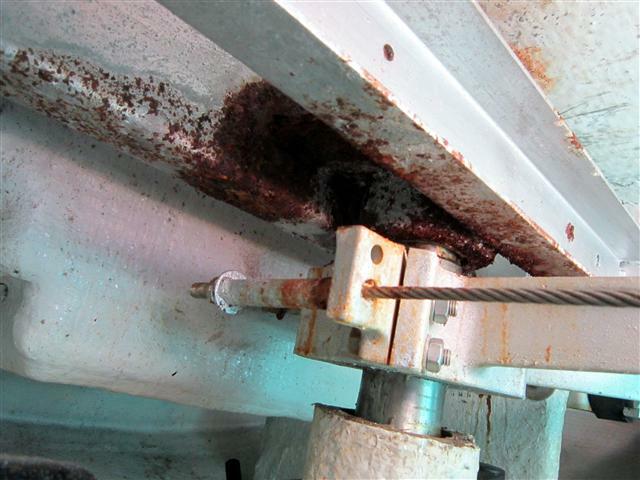 General corrosion is rarely encountered on yachts because the materials specified tend to be corrosion resistant, other than keels, anchors and chain. All of these are protected by coatings of some sort, either paint, epoxy or galvanising. 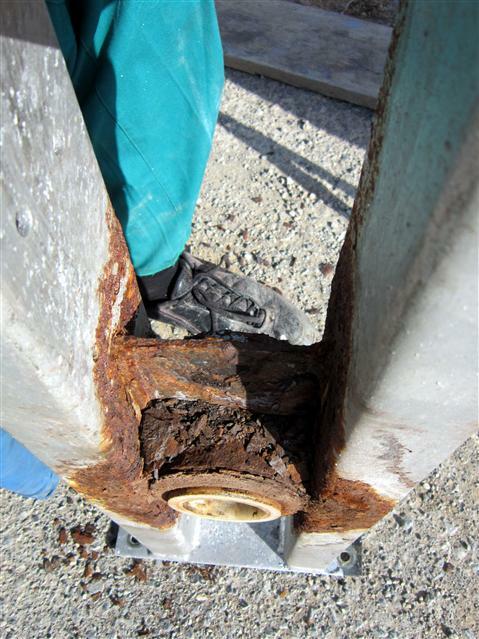 In rare cases there are ferrous galvanised frames, supports and structural items in modern yachts, which need careful inspection from time to time. These photographs show the rudder bearing support as fitted to a Jeanneau Sun Odyssey 45.1 and 45.2. This structure is normally hidden from view and is not easy to see. 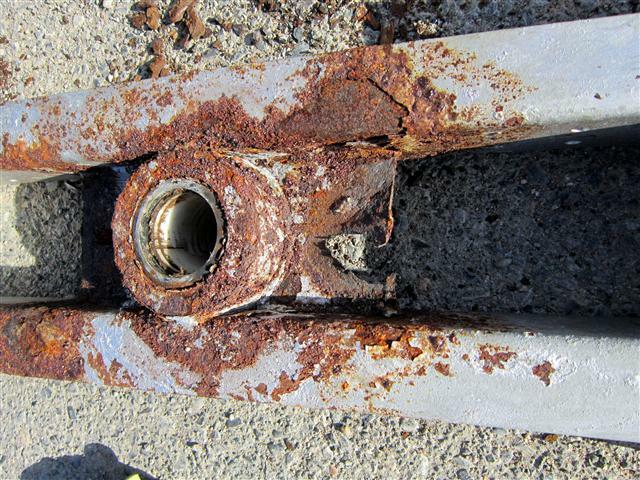 Water runs down the rudder post and pools on the bearing housing, where it remains and can result in severe corrosion. A new bearing support in stainless steel was fabricated locally. 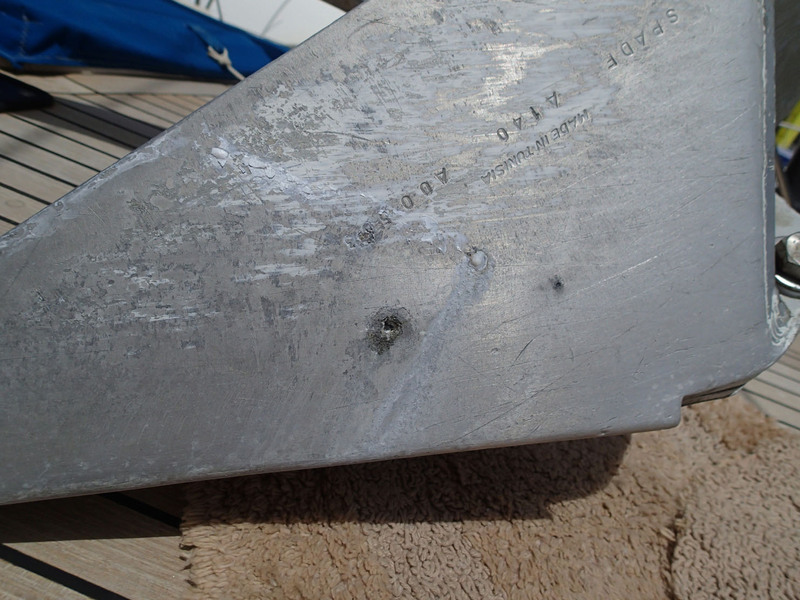 This problem was found on the keel of a Westerly Fulmar when lifted at the end of a season. 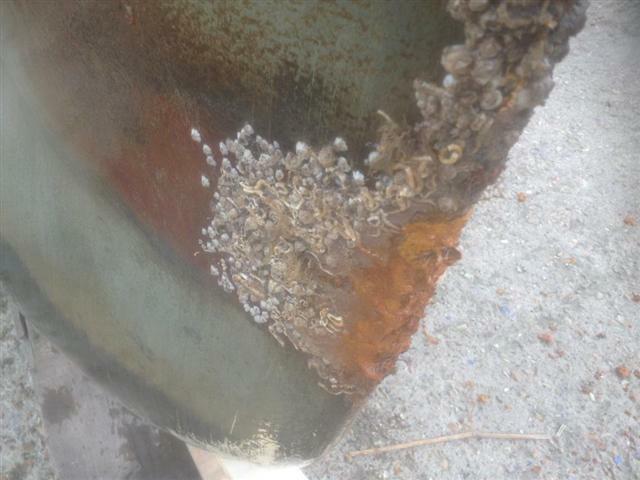 The boat was bought in the previous year out of the water, when there were no significant corrosion problems to be seen either by the owner or the surveyor. 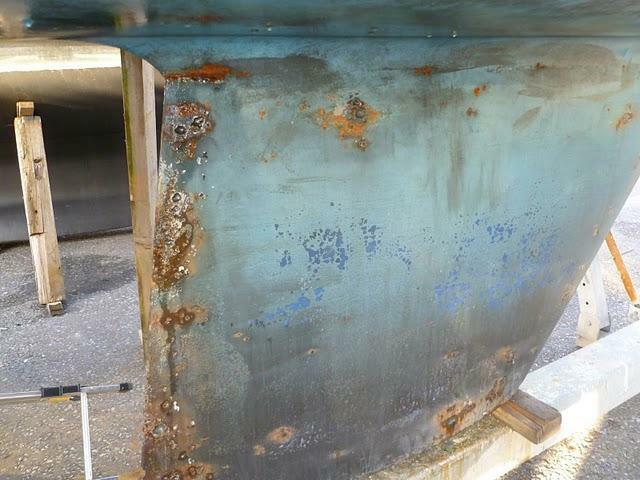 Parts of the keel had been overpainted and this treatment could have covered previous repairs. This is a general view of the damage. It occured on one side of the keel only. The deep pits tend to be smooth, rounded and grey in colour. Red coloured corrosion surrounds the grey pits. The likely cause of this problem is casting porosity in the iron of the keel. It is particularly relevant that the damage is only on one side of the keel, which was cast lying on its side allowing gas bubbles to float to the surface. 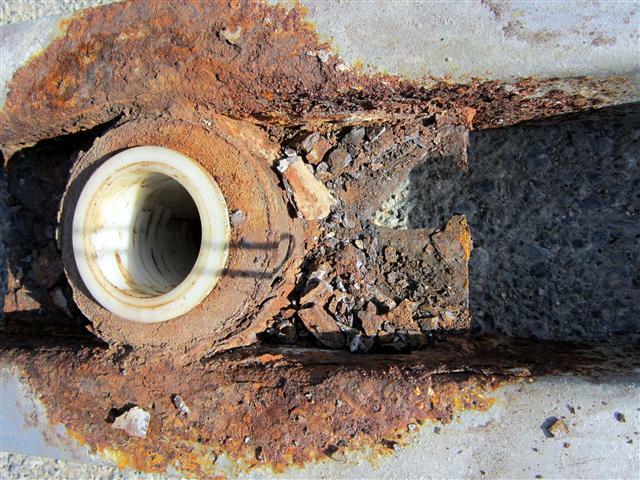 Note how the silver/grey appearance inside the cavities is not corroded, whereas areas around them are red rusty. The grey material inside the rounded pits is slag that is both conducting and more noble than the iron of the keel, a perfect recipe for galvanic corrosion. Areas around the cavities are thus sacrificial and they preferentially corrode to hydrated iron oxide, whereas the slag does not corrode. Further investigation has shown this to be a common problem with Westerly keels. We are aware of other examples on Centaurs, for instance. 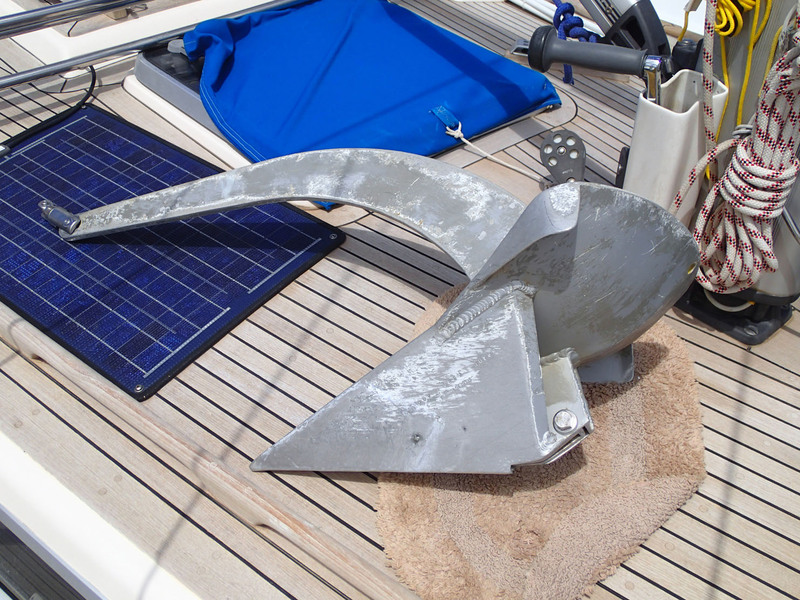 Some of the keels were poor quality castings, prone to this type of damage.Treatment for the condition is to clean out the worst of the rust, fill with underwater epoxy putty and paint with a good quality paint system. Grit blasting would undoubtedly be the most effective method but is probably not justified for a keel. Grinding with a small wheel is probably sufficient in the circumstances. Of course it could be argued that the cavities are not normally visible and they don’t really affect anything. Just painting them along with the rest of the keel may well be sufficient. 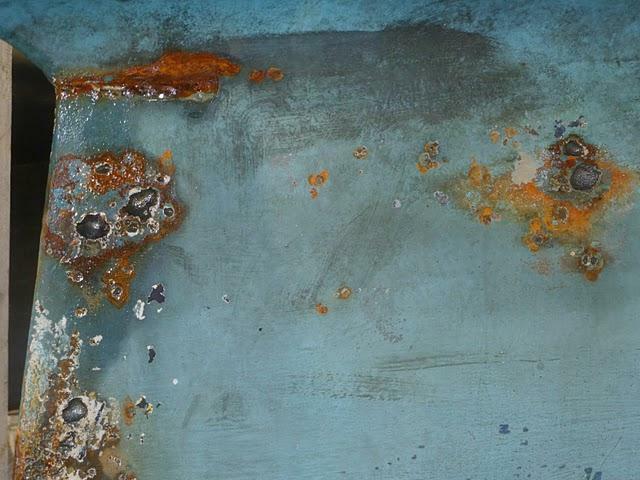 Galvanic corrosion occurs when dissimilar metals connected to each other are immersed in water. A nice example of galvanic corrosion in fastenings. Blakes bronze skin fittings are made of DZR, although the external plate may well be a tin bronze. The standard Blakes bolts should be phosphor bronze, a high strength version of tin bronze. Unfortunately the bolts sold by the chandlery were actually brass. 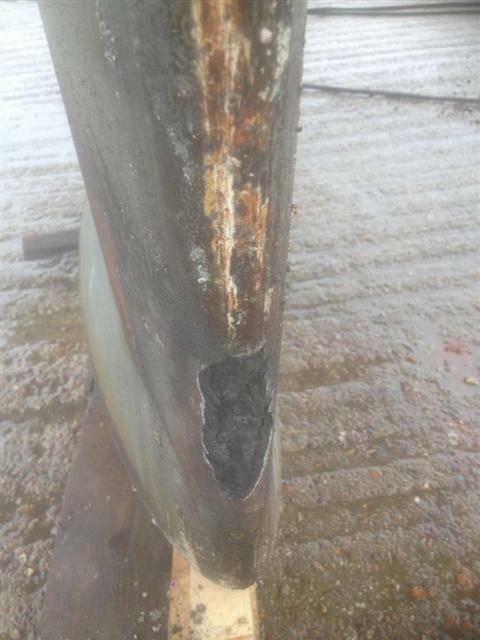 This was only found out after 2 years afloat, at which point the bolts had corroded badly. Galvanic corrosion of lead-filled aluminium anchor. Spade anchors made in aluminium are filled with lead to provide tip weight. 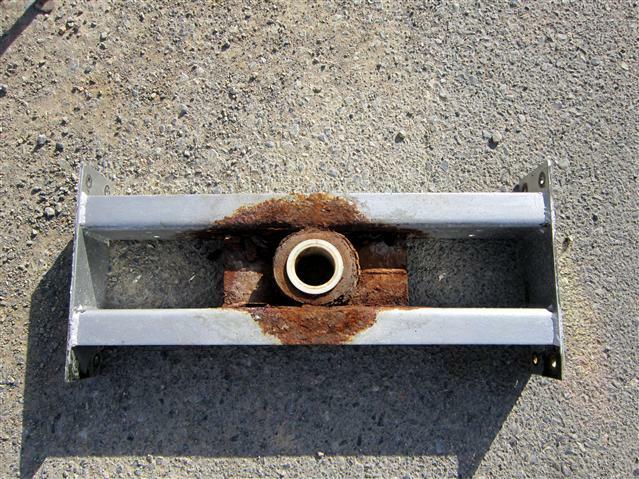 Over a period of a few years galvanic corrosion between the lead and aluminium can occur, changing the shape of the anchor by bulging its faces outwards, and ultimately leading to severe pitting of the aluminium. 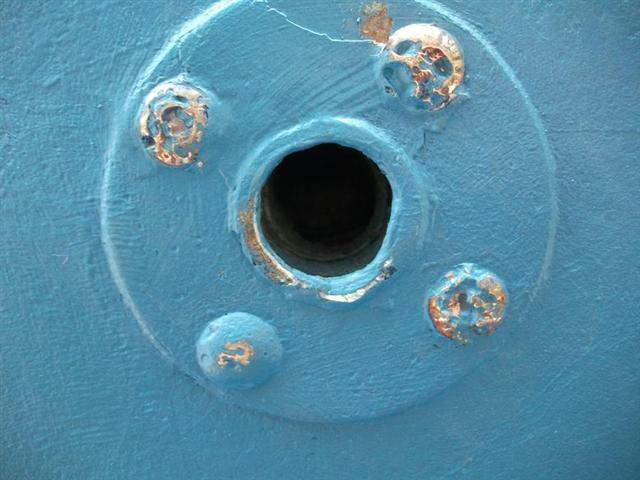 Perforation of the aluminium cheek of the anchor. Corrosive wear occurs when the corroded layer on a metal is immediately removed by wear, exposing a fresh surface to the corrosive medium. The rate of metal loss can be accelerated considerably by the mechanism. 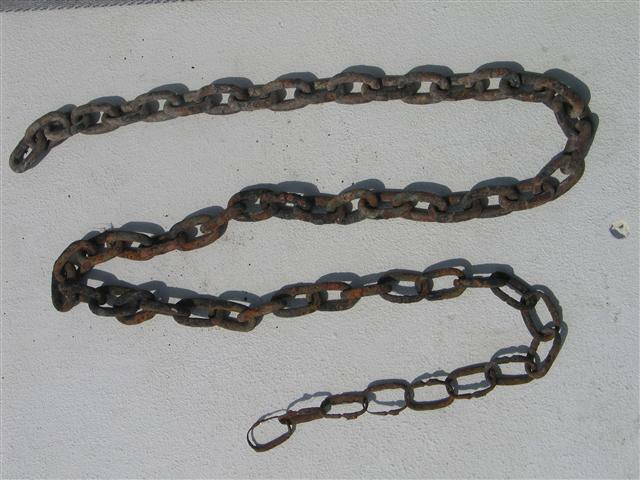 It is common in chain used for moorings, where the small area of the link that is in contact with its neighbour is subject to wear in addition to the general corrosion. In the startling example shown here the severely wasted part of the chain was in contact with the bottom, where it was being continually dragged by the mooring buoy. 1998 Beneteau kept in a tidal river in the Southampton area. The boat was lifted for a pre-season scrub. 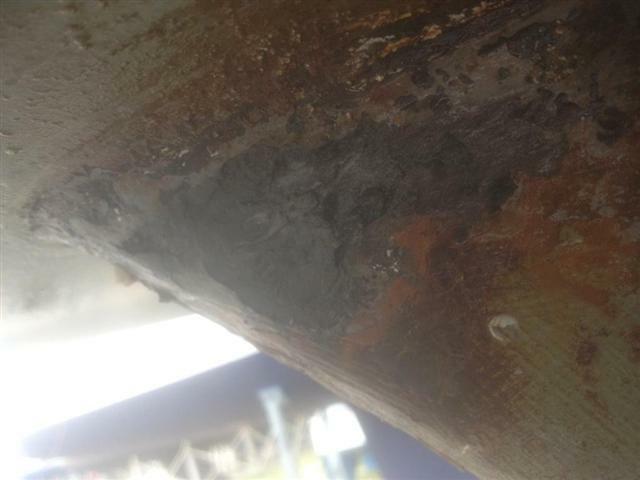 After jet washing some significant areas of the keel were showing signs of rust and had ‘blistered’ rust patches. Once the fouling had been removed it was found that several areas appeared to have lost their surface layer of iron. After scraping the affected areas the material underneath was black and soft, like charcoal. and more came away. Although the substrate became firmer it seemed likely that the soft material continued for a considerable depth. The worst area was on the leading edge of the keel, but there were other areas at the top front and rear edge of the keel. 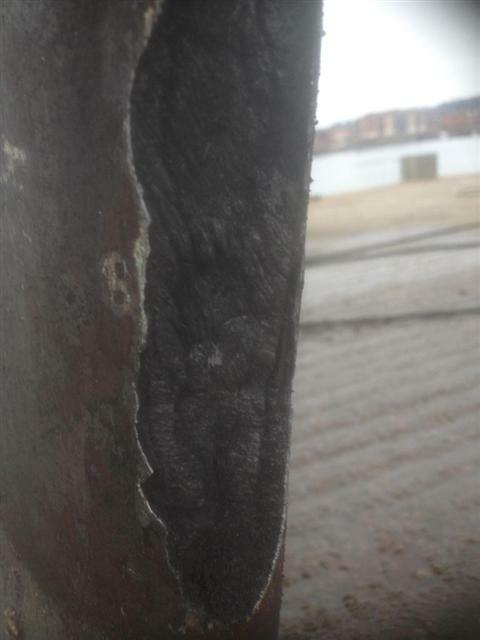 This damage is known as graphitic corrosion, a form of dealloying unique to cast irons but most unusual on a boat. It is observed in gray cast irons in relatively mild environments in which the selective leaching of iron leaves a porous graphite network. Selective leaching of the iron takes place because the graphite is cathodic to the iron, making for an excellent galvanic cell. It mostly occurs in relatively mild environments such as soft waters, waters having a slightly acidic pH, waters having low levels (as little as 1 ppm) of hydrogen sulphide, and brackish and other high conductivity waters. There seems to be some evidence that the shape of the graphite flakes formed when the keel was cast might influence this form of corrosion, which could account for the rarity of the condition. 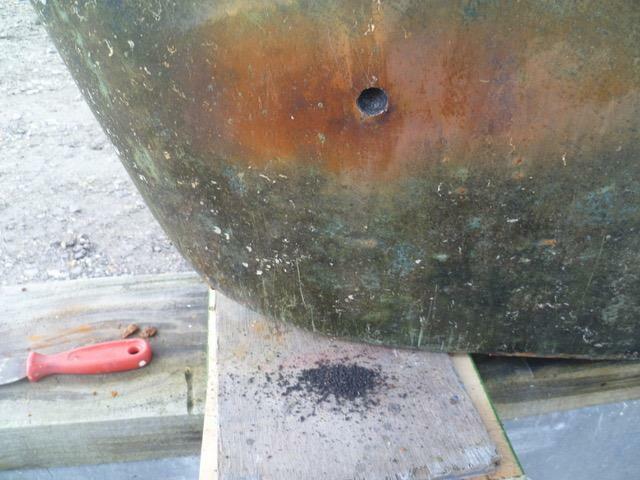 Anodes connected directly to the keel should help, as should coating with epoxy or some other impervious layer. My advice was to cut back the affected areas as far as possible, which should not affect the weight of the keel significantly, then coat and fair with epoxy filler. Unfortunately if it is found that the keel is massively affected, which seems unlikely, the only answer would be a new keel. Note the appearance of the graphite within the damaged area, the result of convection currents within the casting before the iron solidified. An area at the top of the keel that has been affected to a lesser extent. 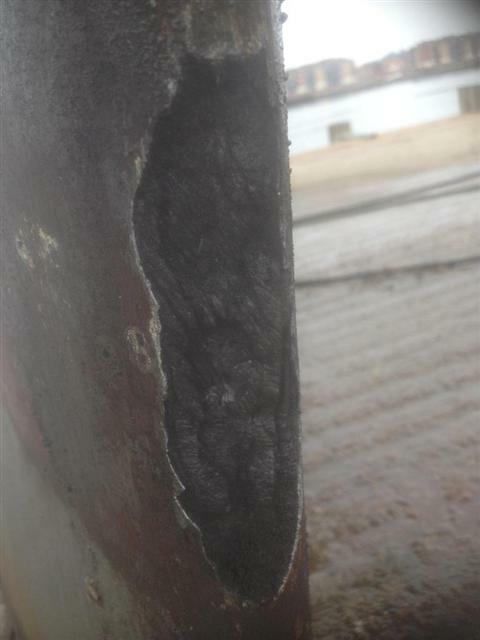 Graphitic corrosion of the keel on a boat that was berthed for 4 years at Kemps Quay at the top of the River Itchen. The keel just touches bottom at low water springs. On lifting out it was noticed that a ‘brown limpet’, was attached to the keel, but poking away with a screwdriver produced a hole. The soft black powdery substance found beneath is graphite, a constituent of cast iron from which the ferrous component has been corroded away. Conditions at this location are typical for graphitic corrosion to occur: brackish water and possible contamination by vegetation.